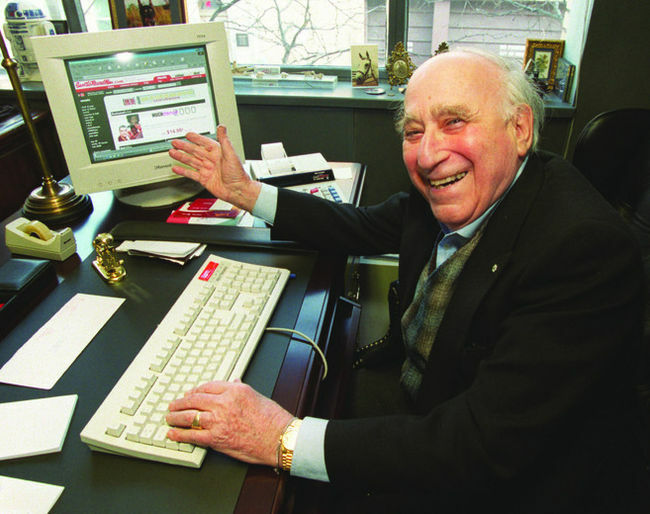 Born in Toronto in the 1920s, Sniderman began selling records and installing car radios at his brother Sidney’s Sniderman Radio Sales and Service store in 1937. He opened a second store 22 years later on Yonge Street and launched franchises in 1969. Music-lovers in Barrie were humming The Day the Music Died at the passing of a true Canadian icon on Sunday. When Sam Sniderman died at the ripe old age of 92, musicians and wannabes sighed with sweet nostalgia and sadness at the memory of their visits to both local and iconic Sam the Record Man stores. Local Fred Grant Squares musician and Barrie Examiner columnist Bruce Cameron remembers his first visit to the local Sam the Record Man store in 1968. “I bought my first album, Yellow Submarine, for $4.98 at Sam’s,” Cameron said Monday after hearing of Sniderman’s passing. “I saved up my money — I was about nine years old — and the first side was great but when I turned it over, the second side was instrumental,” Cameron said amid groans and laughter, remembering his disappointment. But he fondly remembers what the Sam’s store meant to his generation of musicians. “They always had good music on in the store. It was so great just being in there. Music was huge in our lives, maybe because there wasn’t Nintendo, there wasn’t anything else to do,” he said. Tucked at the corner of the Five Points at 2 Dunlop St. E., Barrie’s Sam the Record Man location was one of 140 franchise stores Sniderman opened across Canada. It was destroyed by fire in January 1994, six years before Sniderman retired at the age of 80. According to notes in local author Douglas Skelding’s book Forged in the Fire, Barrie’s Sam the Record Man store ‘…was fully engulfed by 2 p.m. in the afternoon’ and that it took about six hours and 2,000 gallons of water per minute to extinguish the downtown fire. Skelding noted the store was in the same location as Tamblyn’s drug store and that it, too, had been destroyed by fire in December 1942. The former Sam’s lot has since been redecorated and is now the outside patio for the At the Five restaurant. Another local musician, Scott Harradine, worked for Treble Clef Records — one of the largest independent record distributors in Canada at the time — that sold new and upcoming stars’ albums to Sniderman at the downtown Toronto location from 1978 to 1983. “Sam was such a great supporter of the Canadian music scene,” Harradine said. “On my first visit as a salesman, I walked in there and he took me for a tour and introduced me to everyone. Then he showed me the front racks, the main racks where you’d walk in the front door, and guaranteed he’d hold them for me and local Canadian artists. Harradine remembers him as a great businessman, and a true patriot. Harradine says Sniderman was also the driving force behind the first Canadian music awards ceremony. “It was the stuff he did behind the scenes, with RPM Magazine. He was so instrumental in starting the Junos. Sure, it was pretty humble at the beginning — a rubber chicken dinner — but it grew. A service will be held on Tuesday.